The Thrifty Gypsy's Travels : "Mr. Gorbachev, Tear Down This Wall!" This historic challenge by U.S. President Ronald Reagan to the Soviet leader Mikhail Gorbachev in June 1987 embodied the resolution of a world determined to see the oppressive, divisive communist regime of East Germany crumble and bring about the reunification of Germany under principles of freedom. Two years and five months after that speech, on November 9, 1989, the Berlin Wall, which had divided not only the city of Berlin and the country of Germany, but represented the division between the free world and the repressed states under communism, began to fall. Today marks the 25th anniversary of when the East German government announced that citizens of the German Democratic Republic (GDR) could begin visits to West Berlin and West Germany in general. It marks the figurative, if not literal, fall of the Berlin Wall. While I have visited Germany many times, I have yet to visit Berlin or East Germany. However, by serendipitous good fortune, I saw a portion of the Berlin Wall a week ago while it was on display at the University of Virginia in Charlottesville (picture above). The wall itself evoked a mix of emotions in me: satisfaction that it was torn down, sadness that it existed for nearly thirty years, and fascination with the stories of the street artists who tagged their particular story to this portion of the wall. Who were they? How did the Wall affect them? What exultation they must've experienced when the Wall finally came down! Have you ever seen the Berlin Wall - either in Berlin or through a traveling exhibit? 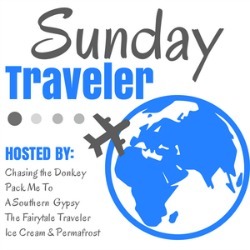 Linking up with Chasing the Donkey for #SundayTraveler! How cool! I really enjoyed reading your post about it! It's strange how a lot of American curriculum kind of fast forwards through more "recent" history. I learned a lot about it, but wasn't in a conventional school. It's kind of neat how they've maintained a traveling exhibit with parts of the Wall. It gives so many of us the opportunity to see it without having to actually go there. I would love to see it one day, or what remains of it. My only real memory unfortunately is that of David Hasselhoff making a fool of himself (yet again) singing in a horrendous outfit when it was torn down. It somehow seemed disrespectful. Perhaps not! I have no actual memories of when the wall came down as I was only a few years old at the time. My husband remembers it, though! He had just recently returned from Germany at that time. I bet!!! Might need to plan on being there for the 30th. I actually went through the wall once, a special tour of East Berlin's cultural highlights for the youth orchestra I was with at the time. Being 13 what I mainly remember is that while we waited for approval they made the coach driver turn the engine and therefor the air con off, and we all promptly suffered hugely from the sweltering heat. Sometimes I do wonder at my teenage self. I'm glad that they were able to preserve sections of the wall with such vibrant artwork on them instead of having everyone just chisel away a little piece for themselves. There's so much symbolism going on in the art in your photos. My hubby went through both West and East Berlin on a family trip, and I've pulled some of those photos of the wall into my own #SundayTraveler post for the week. Thanks for sharing your post! I really enjoyed reading it. And yeah, the symbolism on this wall is really great. After I wrote the post, I came across an article that explained how the king on the left represents West Germany: keen and aware and eager to serve the people who put him in place. The king on the right is blindfolded and represents the East German government's willful blindness to the plight of its people. It's really fascinating stuff.